Edo-nobori were Ryūkyūan pilgrimages to Edo on official occasions, like the enthronement of a new Ryūkyūan king or the succession of a new Shōgun in Japan. During these pilgrimages a very few number of weapons were carried by Ryūkyūans like spears, dragon-blade halberds and red-lacquered cudgels called Muchi. These were a fixed part of all Edo-nobori and seem to have been in line with an official protocol. They were of a rather ceremonial kind and used mainly to underline the “otherness” of Ryūkyū’s exotic nature. As the Ryūkyū pilgrimage was accompanied by hundreds of Satsuma warriors and as the pilgrimage took place inside the boundaries of Japan, there was no actual need to be prepared for self-defense. However, although ceremonial in nature there were obviously some secret police agents or bodyguards among the Ryūkyūans, albeit not openly designated as such and basically acting veiled from outsiders. There is also a hint to martial arts performed during these pilgrimages. On the right side: red-lacquered Muchi as protrayed in a scroll of 1710. Source: Japan National Archives. For example, on Ryūkyūan soil as well as during travels to Satsuma all princes (ōji) and uēkata were assigned to and accompanied by a certain number of police captains (yoriki). As the chief and vice envoys of the Edo-nobori were all princes (ōji) and uēkata it is rather conspicuous that no such police captains are given in the descriptions. This fact can be ascribed to the special circumstances under which the Edo-nobori were orchestrated by the Satsuma: policemen and military were not part of the intended perception portrayed towards the Japanese people and the shōgunate government. Picture scroll of 1710, showing bearers of ceremonial equipment/weaponry following Tomigusuku Oji. Source: Japan National Archives. In 1710 Misato Ōji and Yoza Uēkata were sent as congratulatory envoys for the new Shōgun Ienobu. At the same time Tomigusuku Ōji and Tomori Uēkata were dispatched as gratitude envoys for the enthronement of King Shō Eki. The mission comprised of one hundred sixty-eight Ryūkyūans in total (see Tsuko Ichiran, RKB 9). Among the Ryūkyūan retinue two persons with red-lacquered cudgels are found, described as “bō for punishment”, (seibaibō 成敗棒) and probably made of split bamboo similar to a kendō shinai. They seem to have been invented and intended as a kind of policeman’s truncheon. For the year 1714 it was noted that two Ryūkyūans carried “crimson color bō“ in their hands (See Tsūkō-ichiran). For the Edo-nobori in 1832 we find the red cudgels colorfully depicted and used by the guards, here described as keimuchi 刑鞭, i.e. “baton of punishment”, concurring with the 1710 description (See: Ryūkyū-koku Raiheiki. In: Iha Fuyū Bunko). Keimuchi is another name for the Muchi 鞭, which in Ryūkyūan dialect is pronounced ben ベン or waimuchi ワイブチ, literally whip or rod, described as red-lacquered cudgels or other sorts of bō. 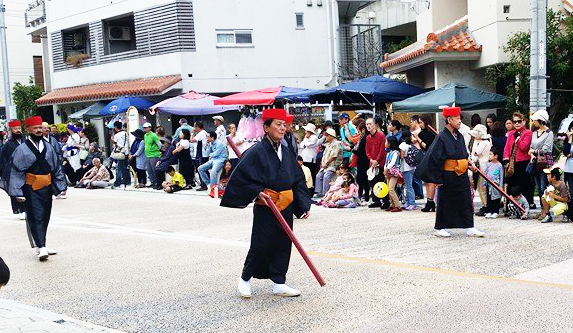 Red-lacquered cudgels during recent Bunka-no-Hi (Culture Day) on Okinawa. Photo courtesy of Ulf Karlsson. A clue to martial artists during Edo-nobori is also found in the mission members called shisan. It is generally agreed upon that they served as chief aides to the chief and vice envoys and are further considered to have been the head of guards and similar to the Japanese uma-mawari, or warriors as bodyguard close to the lord. In fact, police captains are found among the shisan when comparing different accounts: While the Tsūkō-ichiran uses the term “police captain” for specific persons, a picture scroll depicting the Edo-nobori of 1710 uses the term shisan for exactly the same persons. According to my analysis the same is true for the official Ryūkyūan genealogies. In the 1710 Edo-nobori there were 15 shisan, twelve of which were of pēchin rank and three of satonushi rank. They rode on horseback and each was accompanied by two Ryūkyūan attendants on foot. As a side note and as regards weapons in Ryūkyū, the mission presented two swords as gifts to the Shōgun (see TIR-RKB 9, 10). 1710, Kadekari Pechin and Chinen Pechin as Shisan. Japan National Archives. Since at least 1766 a new terminology was chosen: the police captains of the Edo-nobori were abolished and instead “secret investigators” (naishobun) established. For the Edo-nobori in 1790 – for the first and last time – a “secret police captain” (nainai yoriki-yaku) by the name of Misato Pēchin is noted. Afterwards this duty was finally kept completely secret from people as well as from authorities. Find the details of these events, described for the first time in my Karate 1.0. The term kon as seen in today’s bōjutsu is first found in the account of Wang Ji, investiture envoy of 1683. He also describes the official training area for the Chinese officers and military, situated in Tsūji, Kume village, Naha. This was more than 70 years before famous Chinese military officer Kūsankū demonstrated unarmed martial techniques to Ryūkyūans in 1756. This entry was posted in Unknown Ryukyu and tagged Bojutsu, Chinen Pechin, Edo-nobori, Kobudo, Kon, Kusanku, policce captain, shisan, Wang Ji, Wanshu. Bookmark the permalink.